Would I cause consternation, even disbelief, by stating one of the best-kept secrets in the way of precision rifles resides in the Ruger product line? 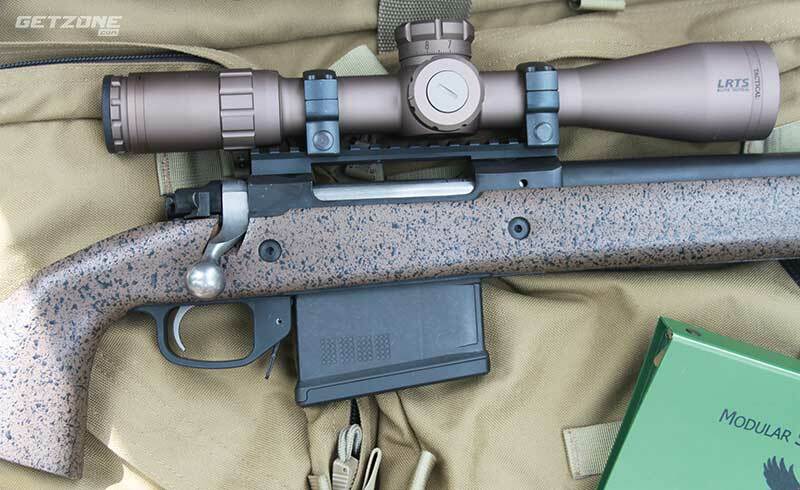 While Ruger rifles are well known and respected, their latest long-range bolt rifle entry is relatively unknown. In the world of modern marketing, it is nice to discover a product in the catalog you feel should be the main story. I am referring to the Ruger Hawkeye Long-Range Target offered in 300 Win-Mag introduced in early 2018. Any long-range connoisseur, albeit hunter, LE, target shooter should cast an eye at the moderately priced Hawkeye Long-Range. The specific role to be filled is up to the end user. Everyone can benefit from having an accurate .300 Win Mag in their safe as it handles so many roles. The saying, “If all you have is a hammer, everything looks like a nail” comes to mind. Bill Ruger established Ruger as a major player in the US market by often going against the perceived norm as defined by market research. At times it seemed Mr. Ruger had a direct link to what the US firearm consumer wanted versus what “expert” gun writers or industry marketing executives pronounced as what would appeal. A simple look at the Ruger #1 single shot rifle explains fully what I am trying to convey. Currently, Ruger offers 400 model variations across 70 different products encapsulated within 25 distinct product lines. Ruger’s place in the American gun psyche in terms of American-made quality and customer service lends credence to their products compared to other manufacturers who may not be as well known within the general shooting public. This stems back to the 1960s when Ruger’s reputation is first established. The Hawkeye Long-Range Target is based on the proven Ruger Model 77 Hawkeye bolt action. 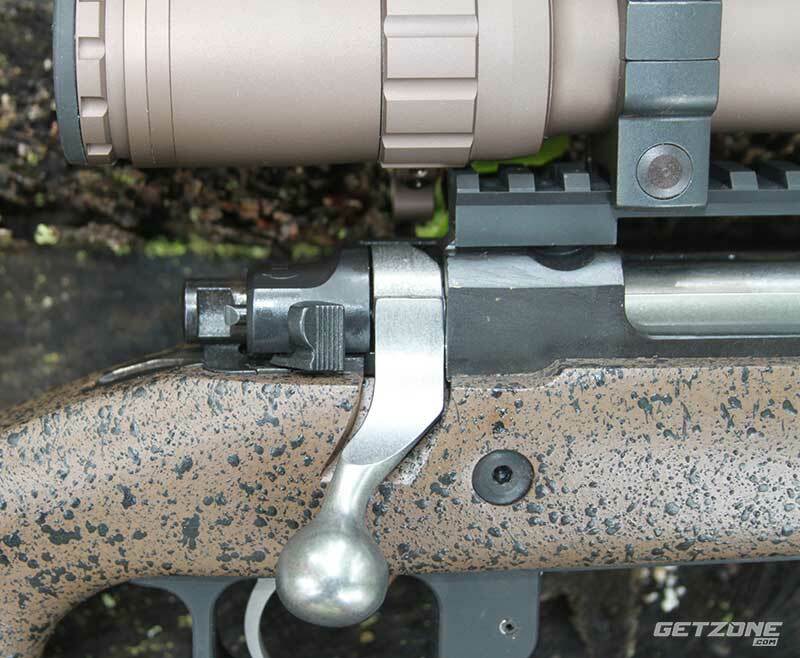 The M77 action takes full advantage of Ruger’s strength in investment castings featuring a blend of the best qualities found in the military Mauser 98 action and sporting Winchester Model 70 actions. The Model 77 is strong and reliable with a following among dangerous game hunters. The M77 bolt action is mated to a laminate stock featuring both adjustable for length of pull via adding/removing space and comb that can be moved along the stock and tweaked for height. The matte finish of the large diameter barrel and action combined with speckled black/brown stock produces an aesthetically pleasing look while also being utilitarian in its non-glare finish. The LR Target stock has a wide square forearm for use with bag rests, packs, or bipod. There is a flush mounted M-LOK rail embedded in the forearm that allows for multiple studs to be placed in various positions for bipod and sling mounting. QD attachment points along the stock are another option for mounting a sling. A hook style buttstock rides rear bag support well and provides a purchase point for shooters off hand when shooting prone or off a bench. The LR Target stock has a wide square forearm for use with bag rests, packs, or bipod. There is a flush mounted M-LOK rail embedded in the forearm that allows for multiple studs to be placed in various positions for bipod and sling mounting. The Ruger Hawkeye LR features a free-floated, 26″ cold hammer-forged 4140 chrome-moly steel barrel with 1:9RH 5R rifling with tight tolerance bore/groove dimensions, minimum headspace, and centralized chamber. 5R rifling was developed by Barrett “Boots” Obermeyer. 5R is different from conventional rifling by changing the shape and configuration of the lands and grooves. 5R use 5 lands and grooves versus the more common 4 or 6 land/groove profile. This puts lands opposite of grooves with another tweak being the transition from the top of the land to the groove is sloped. 5R reduces projectile deformation as it passes through the bore during the firing sequence. More uniform projectile means better accuracy. 5R rifling is easier to clean and less prone to accuracy-robbing fouling. All of this is not an abstract theory as 5R rifling has developed a dedicated target shooting following that swears by it. The Hawkeye LRT features a laminate stock with both an adjustable length of pull via adding/removing space and comb that can be moved along the stock and tweaked for height. Many of the precision rifles coming online today reflect more of singular target shooting heritage weighing over 16 lbs. versus more practical measurements. While stout at 11 lbs. and overall length of 47.5″ with the removable Ruger Hybrid muzzle brake threaded on, the Hawkeye Long-Range is not ungainly for carrying afield. Non-prone shots are possible, though seeking some sort of stabilized position is more ideal. A five-round AI style detachable magazine feeds rounds into the Ruger’s chamber. The magazine is of single stack design allowing for centerline feeding reliability as well maintaining as much stock material as possible to support the action for better potential accuracy. Ruger designed the Hybrid Muzzle Brake to effectively reduce recoil while minimizing noise and blast to the sides of the shooter. Importantly, Ruger chose to factory mount a 20 MOA Picatinny rail secured with four #8-40 screws for increased long-range elevation capabilities overtop the traditional Ruger patented integral scope mounts that are machined directly on the solid-steel receiver. This offers the user ultimate flexibility for mounting optics. A Bushnell Elite Tactical LRTS 3-12×44 optic was mated to the upper receiver rail with 30mm Leupold rings. The LRTS features a G3 reticle with other patterns available based on user preference. The LRTS is not your grandpa’s Bushnell. The Bushnell LRTS can be fitted to the biggest magnum boomers due to constant 3.74″ eye relief. The Bushnell’s tough construction is perfect for recoil resistance due to inertia forces experienced during recoil, especially with semi-autos. Making adjustments is a simple and accurate process, with a lockable windage turret and an elevation turret featuring a RevLimiter Zero Stop that will not turn past zero. 10 MILs per revolution for elevation and windage turrets allow for exact and quick adjustments. The Bushnell LRTS 3-12x is an excellent companion for the Ruger Hawkeye Long-Range. The Bushnell LRTS is one of the best-valued scopes on the market. It has the typical great Bushnell reliability, clarity, and image quality with a near perfect variable power range. Ruger chose to factory mount a 20 MOA Picatinny rail secured with four #8-40 screws for increased long-range elevation capabilities. This offers the user ultimate flexibility for mounting optics. A Bushnell Elite Tactical LRTS 3-12×44 optic was mated to the upper receiver rail with 30mm Leupold rings. The LR Target benefits from an adjustable two-stage target trigger with a 3.5 lbs. pull weight –verified on my RCBS trigger scale. The effects of a good crisp trigger can’t be underestimated in the terms of wringing out the most accuracy. The Ruger Match two-stage trigger is a huge part of the accuracy equation. A rifle’s trigger is the interface between shooter and rifle. A by-product of the Ruger Hawkeye action is the three-position safety conveniently located on the side of the receiver for smooth, quiet operation. The Ruger safety has “fire”, “safe”, and “safe locked” positions. “Safe” position allows the bolt to be manipulated while still providing a mechanical safety and the “safe locked” position prevents the bolt from being worked at all. The safety is silent to operate with no audible clicks emitted when manipulating. The Ruger three position safety moves silently between “fire”, “safe”, and “safe locked” positions. Ruger literature states that the goal with the Hawkeye Long-Range’s Hybrid muzzle brake is to effectively reduce recoil while minimizing noise and blast to the sides of the shooter. The 11-pound Hawkeye LR combined with Hybrid brakes produces felt recoil similar to a .270 Win. My shoulder is not a scientific instrument, but the brake was quite effective allowing for quick follow-up shots and if the shooter was in a stable shooting position spotting one’s own round impact was possible. I used the following .300.Win.Mag loads were utilized for evaluating the Ruger Hawkeye Long-Range: Black Hills 180-grain Accubond, SIG SAUER 190-grain OTM, Federal Premium 190-grain Sierra Matchking, Hornady 195-grain ELD Match, Hornady 200-grain ELD-X. None of the loads tested disappointed providing MOA or better accuracy — a great compliment to ammunition, optic and rifle. The logistic advantage of a rifle that is not finicky is hard to overemphasize. Numerous brands of premium ammunition were utilized in wringing out Hawkeye Long Range Target performance. Accuracy from the Hawkeye Long Range Target supported what many had been saying about Ruger’s investment into new machines in terms of their barrels. The Hawkeye’s weight translates into a rifle that can be carried afield without overly fatiguing the user and possible to adapt to non-prone firing positions even offhand if needed. After the bench work testing innate accuracy at Echo Valley Training Center’s (EVTC) Range #2, I performed some of my normal field tests. These consisted of shooting prone off a bipod or pack at clay pigeons at 300 yards from prepared “dug in” positions offered at EVTC. I worked the bolt and acquired the next target as quickly as possible on the 4.33″ diameter clay pigeons. The Hybrid muzzle brake combined with the ergonomic stock and smooth bolt proved potent. Other range work consisted of shooting B-27 man-targets out to 600 yards on EVTC’s Known Distance Range. 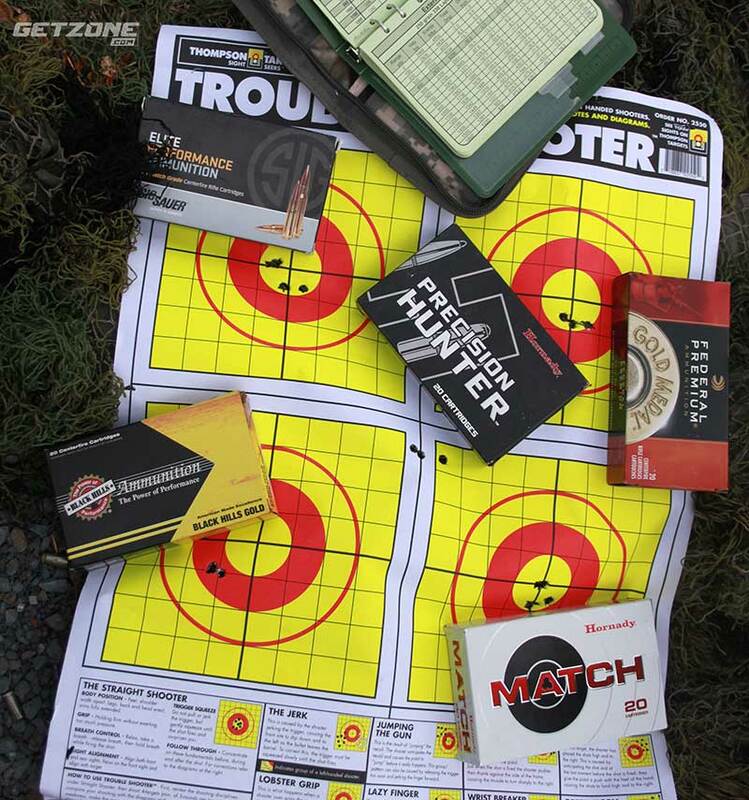 Ruger accuracy combined with premium ammunition and clear optics enabled center mass shots with ease. The key point with the Ruger Hawkeye Long-Range is out of the box accuracy without having to resort to a full-blown trip to an agency armorer or gunsmith for tuning. The Ruger Hawkeye LR takes a back seat to no rifle in terms of precision, repeatable accuracy, ergonomics, reliability, trigger, and safety. For many, a .300 Win Mag Hawkeye Long-Range makes more sense than jumping into a .338 Lapua or 50BMG weapon platform. Ruger Hawkeye Long-Range Target .300 Win Mag with BLACKHAWK!! drag bag rifle case and data book. No matter how well the rifle performs other gear is always needed for deployment.